In my first post on the NLM, I want to look at the pallium, which has seen a recent change introduced at the installation of our reigning Pontiff, Benedict XVI. (The lambs of whose wool this year's new pallia will be made were blessed this Monday, at which occasion the Holy Father wore a beautiful old papal stole again, this time of Leo XIII). Let us begin by looking at the history of this parament. To this end I will give a translation of parts of the pertinent chapter from the book by Fr. Joseph Braun, Die liturgischen Paramente in Gegenwart und Vergangenheit (The Liturgical Paraments in Present and Past), which has been reprinted by German Catholic publisher Nova et Vetera as recently mentioned by Shawn. "The time at which the pallium was introduced can not be determined. According to the liber pontificalis, it was already in use at Rome in the second quarter of the 4th century; for it tells us that Pope Marcus († 336) had granted the pallium to the bishop of Ostia as consecrator of the popes. 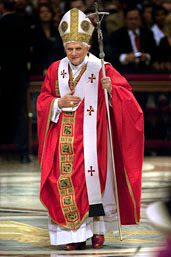 However reliable this information may be, in any case the pallium must have been used at Rome well before the beginning of the 6th century; or else the author of the liber pontificalis, who lived at the beginning of the 6th century, could not have possibly ascribed its concession to the bishop of Ostia to a pope from the first half of the 4th century. But also the safely attested concessions of the pallium from the first half of the 6th century - e.g., in 513 St. Cæsarius of Arles was granted the pallium by Pope Symmachus - prove that the pallium had come into use at Rome at the latest in the course of the 5th century. 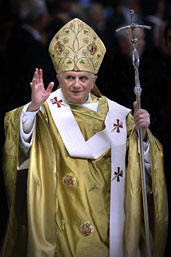 "In the occident, it was always solely the pope who was by his own right entitled to wear the pallium; all others were always only allowed to use it by a special grant conceded by him. 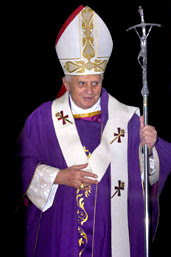 Some examples of such concessions of the pallium are already found in the 6th century, especially in the pontificate of Gregory the Great. Above all it were papal vicars and metropolitans who were deemed worthy of the honour of the pallium, but probably also simple bishops, suffragans of the metropolia of Rome as well as bishops not belonging to that circumscription, of which latter the first one to obtain the pallium was Syagrius of Autun at the hands of Gregory the Great. The pallium had certainly not yet become a general decoration of archbishops by the turn of the 6th, but probably not even in the eighth century. In any case, as we can see from the correspondence of St. Boniface with Pope Zachary, during their lifetimes there was no obligation for metropolitans to petition Rome for the pallium. Such an obligation can only be demonstrated in the second half of the 9th century and must therefore have come into practice approximately between 750 and 850. Its introduction had as purposes a deeper connection of the metropolitans with the See of Peter, the centre of unity and ecclesial life, the elimination of self-aggrandising efforts of some metropolitans of that time and a new consolidation of the system of metropolitans, which had gotten into dissolution and decay." "As for the material of the pallium, from time immemorial it was normally made of white wool, but even in the 10th century other material was not inadmissible per se, as can be deduced from a bull of John XV to Archbishop Liavizo of Hamburg. "As decoration of the pallium, only crosses had ever been employed. In the beginning, two only were applied, one on the front and one the back end. A greater number of crosses seems only to have become common during the 9th century, but a determined precept about their number did not exist in the entire middle ages. Even the pallium of Archbishop Klemens August of Cologne († 1761) still showed eight crosses, not six like today. "Concerning the colour, the crosses on the older monuments are normally blackish, but red ones do also occur. The medieval liturgists mostly describe the crosses as red. On the few remains of pallia which have been preserved from the middle ages, the crosses are mostly black resp. dark blue; they are red on the fragment of a pallium from the 15th century in the Trier cathedral museum. Of the eight crosses of the pallium of the Archbishop Klemens August two were black, the other ones red. In short, also regarding the colour of the crosses until the most recent times there was no fixed rule, only that they were either black (dark blue) or red, but not of another colour. "The pins, with which the pallium was fixed in the 8th century, remained even when the pallium had taken on a fixed form, initially perhaps still to affix the pallium to the chasuble. Later, and thus at least already about 1300, they were mere decoration, which is why now loops were attached at the crosses to receive the pins." Obviously, the earliest form was adopted. The question already arises whether the readoption of this form, which has not been worn in the West since the eighth century, i.e. for almost 1300 years, discarding a continuous development of 1000 years, does not constitute a form of antiquarianism. Furthermore, even though the earliest form has been adopted, the pins have remained. As we have seen, the pins only appeared when there was need for them, because the ends of the pallium did not hang down directly from the shoulder anymore, but from the middle, to which they were fixed by these pins. The continued use of the pins together with a form that was worn before the use of the pins first arose seems inconguous. They serve no purpose, and while that is not necessarily an argument against them and they did not serve a practical purpose in the pallium as worn until 2005 and still worn by metropolitan archbishops, there they represent, as so many elements of paraments, the vestige of a former use. But in returning to a form used before the first appearance of the pins, these become anachronistic. Likewise, the change in the colour of the cross appears somewhat arbitrary. As we have seen, the earliest monuments only show black crosses, and there never was a fixed rule until relatively recently, when the colour was settled on black. To choose red for all the crosses seems unmotivated. The same could be said of their number. When a pallium of this form was worn, it was adorned by only two crosses. The five crosses we now see are without example. Lastly, the introduction of a special form of the papal pallium as opposed to that of the metropolitans is without precedent and runs counter to that deeper bond of unity which is to be symbolised by the concession of the pallium to the metropolitans. These are some considerations which might be taken into account when evaluating the introduction of this new form and the desirability of its continued use. Obviously, as mentioned above, there are also other considerations. Also, it should again be stressed that these somewhat critical thoughts about the new form of the pallium do not in any way detract from the immensely praiseworthy work of a gradual reorientation and re-reform of the liturgy, which His Holiness has begun to undertake. "Also regarding the days, the use of the pallium by archbishops and bishops is restricted. It is only on certain high feasts named in the Pontificale and very special occasions, as the conferral of Holy Orders, the Consecration of a bishop and the blessing of abbots and nuns, on which they may wear this vestment, unless more has been conceded to them by special privilege." This rule, certainly known to our ceremonialists, seems to have fallen into oblivion, since, as far as I know, it doesn't apply any more under the new Pontificale. This can be seen by the pictures of the two pontifical Masses below, celebrated by Msgrs. Piñera and Prendergast, who each wore their pallium on a day not specified under the old rules. This is not to criticise these bishops, who were certainly and understandably unaware of the rule. However, I believe in the context of a Mass in the extraordinary form of the Roman rite the old Pontificale should be followed, and the pallium therefore only be worn on the days there specified.